DESMOINES – Iowa Barnstormers Head Coach and Director of Football Operations Mike Hohensee announced today that the team has been assigned Wide Receiver Deryn Bowser on a one-year contract. He becomes the fifth player assigned to the Barnstormers roster for the 2013 season. Bowser (6-1, 212) was assigned to the Barnstormers last season, when he suddenly suffered a devastating knee injury working out on his own prior to the start of training camp. He spent the 2012 season on the team’s injured list while going through surgery and rehab. One year later he has been given a clean bill of health, and a second chance to make the Barnstormers roster. Bowser played his college football at the University of Akron. In two seasons with the Zips, he started 17 of 18 games and registered 85 receptions for 1,092 yards and 9 touchdowns. Prior to his time at Akron, Bowser spent two years at Los Angeles Harbor College where he set school records with 109 receptions and 19 touchdowns. The Los Angeles, CA native, most recently participated in the Arizona Cardinals training camp before being released. “We're excited about the style of play Deryn brings to the Barnstormers. He is a big, physical play maker who attacks the ball,” stated Hohensee. “Hopefully he’ll be able to get back to an elite level of play”. Season tickets for the 2013 Iowa Barnstormers season remain on sale now for as little as $99.00 per seat. Don’t miss a minute of the action this season! 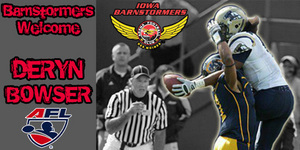 To order your seats or for more information, call the Barnstormers at (515) 633-2255 or log onto www.theiowabarnstormers.com.